Fig. 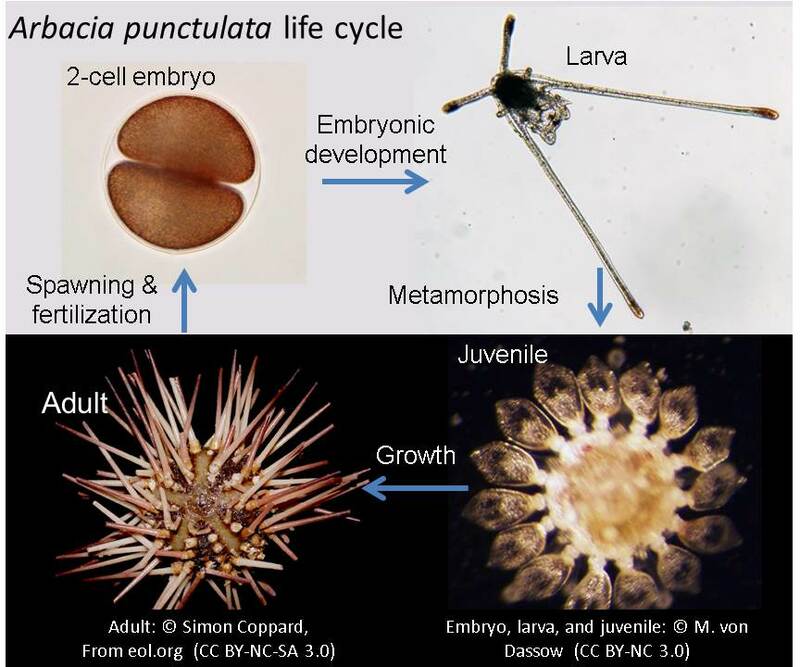 1: Life cycle of a typical sea urchin, Arbacia punctulata. The goal for this project page is to devise a fast, cheap, and easy method to screen treatments (e.g. drugs, pollutants, other environmental conditions) to identify ones that have some mechanical effect on sea urchin embryos, before doing more difficult experiments to determine the nature of that mechanical effect. See comment by MV for more on why this challenge project matters. Although the focus is sea urchin embryos, people can participate in the project who do not have access to urchin embryos. A design for a device to use in testing large numbers of embryos at once. A physical implementation of the device. Experimental validation of the device. With urchin (or other) embryos. Why sea urchins: Sea urchin embryos are an important model system in developmental biology because they are relatively easy to get, culture, and do experiments with. What has been learned from sea urchin development has greatly helped researchers understand development and cell biology in other animals. Although the focus for this project page is developing a technique to be used with sea urchins, the technique could be applied to lots of small, soft spherical things (e.g. other round embryos, spherical cell aggregates, other organisms, such as Volvox, etc.). Some of the advantages of using sea urchin embryos for developmental biomechanics include their transparency, geometric simplicity and symmetry, and their physical sturdiness. These properties make mechanical analyses and experiments much easier in sea urchins than in other major model systems. In addition, one can get them in large numbers and culture them easily. The sea urchin life cycle (Fig. 1) starts with a single cell, the egg. After fertilization, the egg divides multiple times to form a spherical shell of cells — one cell thick — around a cavity. At this point the cells in the layer (the epithelium) form cilia, and hatch out of the protective coat surrounding the embryo, to swim freely in the ocean. During this period —the blastula stage — they do not have neurons, muscles, or any differentiated tissues. They are just an (approximately) spherical ball of cells. Soon, cells leave the cell layer at one end of the embryo, and crawl inside the cavity (Fig. 2). Later in development, those cells will form the larval skeleton. Fig. 2: Hatched blastula-stage embryo of the sand dollar1 Dendraster excentricus. This video was filmed at approximately real time. The embryo spins because the cells have beating cilia that make it swim. Normally it would also move forward rapidly (a few body lengths per second), but it was trapped to make the video. You can see the outer cellular layer (the epithelium), the blastocoel space inside, and the cells that have crawled inside the embryo (the mesenchyme cells) at one end of the embryo (the "vegetal" pole). The embryo was approximately 190 µm long. It was imaged by Mickey von Dassow using an Olympus BH2 microscope (40x objective, bright field), and a Lumenera microscope camera. Because the embryo hatches as a blastula, there are no protective coats to remove, which is convenient for experiments; however, because they swim, they don't stay on the bottom of a dish, which makes some kinds of experiments more difficult. After the blastula stage, one end of the embryo dimples inwards2. The dimple extends to meet the other side of the embryo, forming a tube. This tube becomes the larval gut. These and other processes transform the embryo into a larva, which looks a bit like Sputnik (Fig. 1). The juvenile sea urchin grows inside-out within the swimming, feeding larva3. Once it finds the right habitat, the larva undergoes the process of settlement and metamorphosis: the juvenile adheres to the sea floor, and turns right-side-out; and the larval structures are lost. The juvenile then grows up to be the adult sea urchin people are familiar with. This project is put up as a "challenge project", by Mickey von Dassow. Who I am: My research focuses on the roles of mechanical processes in biological development. I am fascinated by how organisms create complex structures reliably, despite all the things that could disturb their development. I did research on the role of tissue stiffness and viscoelasticity in vertebrate morphogenesis (specifically gastrulation; e.g. ) for several years as a postdoc, before switching to sea urchins and sand dollars (which are just flat urchin) as my study organism. I am currently a guest researcher at the Duke Marine Lab, and the founder of IGoR. Challenge duration: This challenge will be open until May. 30, 2015. Page-specific policies: Anyone may leave comments on this challenge project's page, but please ask me before editing the page itself (email me and tell me a bit about your skills and scientific interests). What constitutes solving this challenge: A working device or method that provides an index of mechanical properties in >15 small (100 - 200 µm diameter), soft, round objects within 10 minutes. It should be plausible that it could work for swimming organisms (e.g. urchin embryos), but does not need to have been tested with them. Basically I want something with a good enough chance of success to try with real embryos, and to compare to other, more detailed, measurement methods. Project significance: The larger question that motivates this IGoR project is: To what extent does biomechanics control how environmental factors affect development? Development of an embryo, or during the continual changes of adult tissues, involves deformations and movements of cells and tissues (i.e. morphogenesis). These deformations are driven and resisted by forces applied to, and by, the cells and tissue. Therefore, mechanical properties such as tissue stiffness, pressure, and others, are thought to be critical for normal development. The mechanical properties of cells and tissues are the result of interactions among a very large set of proteins and other molecules. It's not just the amount of one protein or another, but also the structure (e.g. how fibrous proteins are oriented and linked together, and how they are distributed). Therefore, many environmental and genetic factors might influence cell/tissue stiffness, viscoelasticity1, and force generation. Such changes could cause developmental defects (e.g. if some factor causes the cells to exert too little force to deform the embryo, the embryo may not undergo normal shape changes), or increase the risk of developmental defects. Understanding whether and how mechanics links development to the environment should help us understand the evolution of morphogenesis (by learning about selective pressures acting on morphogenetic processes), and understand the mechanisms that cause or prevent developmental defects in natural populations. To study these larger questions, it would be very helpful to be able to screen a bunch of different conditions, possibly in combination with each other, to see which, if any, have a detectable mechanical effect. Most methods for measuring mechanics of embryos work one embryo at a time, and take at least 10 min per embryo (including setup). That may not seem like much, but — given embryo-to-embryo variability  and changes in mechanical properties with developmental stage — it limits the number of conditions one can practically test. 1. Viscoelasticity is the extent to which the material acts like a viscous fluid or an elastic, spring-like solid. Over the next few days, I plan to add some diagrams of some ideas for simple devices I've had kicking around in my head for how to do this. But first I have to draw them, and I thought it might be good to let people think and use their imagination for a bit before I chime in. Here are diagrams of three ideas I've had, each of which has some potential, but also some problems. Top diagram: a cover glass is mounted on a slide at a shallow angle (thin gray bar), and media (seawater) flows from one side to the other (arrows) pulling the embryos (blue circles) with it. How far the embryos get along the cover glass should depend on a combination the flow speed, and the embryos' stiffness, size, and friction. The advantage of this setup would be that one could do large numbers at a time and it would work with swimming embryos (as long as the flow rate is greater than their swimming speed). The downside is that it would also be sensitive to variation in friction and embryo size, not just their stiffness. The size may not be much of a problem except in that it would affect the drag. Middle: Here the embryos (blue circles) would get sucked by water flow (arrow) into a conical opening (perhaps the end of a micropipette inserted into another glass tube). As with micropipette aspiration methods for measuring mechanical properties, one could measure their deformation for a given pressure (once the embryos get stuck in the cone). It would be less dependent on friction and size (the scaling would be simple). The advantage over micropipette aspiration is that one wouldn't have to capture individual embryos: they'd flow in until they reach the part of the cone that matches their diameter. Then one could increase the suction to pull them through the hole, slow it down again, and capture the next one. The main disadvantage is that one would get only a small increase in the speed of measurement over micropipette aspiration. Bottom: Using a fairly cheap protein (protamine sulfate) one can get swimming embryos to stick weakly to glass. If one could get enough of them stuck down, one could carefully lower a known weight (the gray bar; perhaps a thin cover glass) on top of several of them at once. This would allow one to measure the average stiffness of a large number at once. The advantage of this is that it would give a fairly direct estimate of their stiffness. Two minor disadvantages are that the embryos stick only weakly, and it would be difficult to lower the cover glass gently, and uniformly enough. A bigger disadvantage is that — in contrast to the top two methods — one would not get a very clear estimate of variability in stiffness among embryos. 1. Sand dollars are basically flat sea urchins with very short spines. 2. The vegetal pole of the embryo, the same part of the embryo where the mesenchymal cells crawled inside as individual cells. 3. There are some urchins which do not feed as larvae, and develop a bit differently.